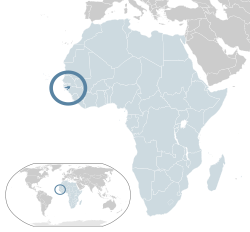 The Republic o Guinea-Bissau (/[unsupported input]ˈɡɪni bɪˈsaʊ/; Portuguese: República da Guiné-Bissau, pronounced: [ʁeˈpublikɐ dɐ ɡiˈnɛ biˈsaw]) is a kintra in Wast Africae. It is bordered bi Senegal tae the north, an Guinea tae the sooth an east, wi the Atlantic Ocean tae its wast. It covers 36,125 km² (nearly 14,000 sq mi) wi an estimatit population o 1,600,000. Guinea-Bissau wis ance pairt of the kinrick o Gabu, pairt o the Mali Empire; pairts o this kinrick persistit till the 18t century, while ithers wur pairt o the Portuguese Empire. It then became the Portuguese colony o Portuguese Guinea in the 19t century. Upon unthirldom, declared in 1973 an recognised in 1974, the name o its caipital, Bissau, wis addit tae the kintra's name tae prevent confusion wi the Republic o Guinea. Anerlie 14% o the population speaks the offeecial leid, Portuguese. 44% speak Kriol, a Portuguese-based creole leid, an the remainder speaks native African leids. The main releegions are African traditional releegions and Islam, an there is a Christian (maistly Catholic) minority. It is a member o the African Union, Economic Community o Wast African States, Organisation o the Islamic Conference, the Laitin Union, Community o Portuguese Language Kintras, La Francophonie an the Sooth Atlantic Peace an Cooperation Zone. The kintra's per-capita gross domestic product is ane o the lawest in the warld. ↑ "The World Factbook – Field Listing – Population – CIA". Central Intelligence Agency. Retrieved 7 March 2015. ↑ "2016 Human Development Report Summary" (PDF). United Nations Development Programme. 2016. pp. 21–25. Retrieved 21 March 2017. Wikimedia Commons haes media relatit tae Guinea-Bissau. This page wis last eeditit on 6 Januar 2019, at 17:13.